DIY Valentine’s Day Gifts – 17 Amazing Ideas, Plus 3 Cheats! You may feel like you’re not over Christmas yet, but believe it or not, Valentine’s Day is just around the corner! Don’t worry if Christmas has burned a hole in your pocket though, there are some amazing ideas around for DIY Valentine’s Day gifts you can make yourself. They’re loads of fun to create too! And don’t worry, we’ve carefully selected an array of DIY Valentine’s Day gifts that will be genuinely well received, so you won’t feel like you’re scrimping! Quite the opposite in fact, as all of the DIY Valentine’s Day gifts we’ve chosen are beautiful, thoughtful, and in several cases, delicious! 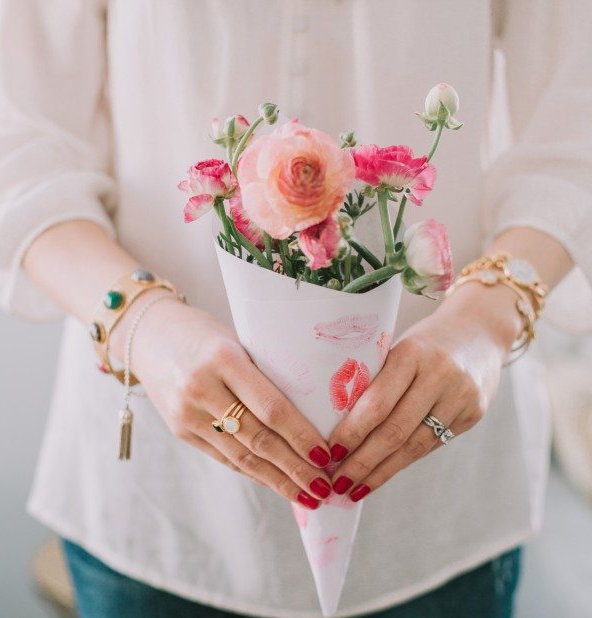 We’d choose to receive these gorgeous DIY Valentine’s Day gifts over shop-bought ones every time, but if you can’t spare the time, or would rather buy something beautiful instead, we’ve included a few ‘cheat’ options for you at the bottom! They all look beautiful enough to be handmade, but you can order them in seconds on line! Happy crafting, and have a lovely Valentine’s Day! Some links on slightlysorted.com are affiliate links – please see the disclosure tab on the sidebar, footer, or main menu for details – thank you. 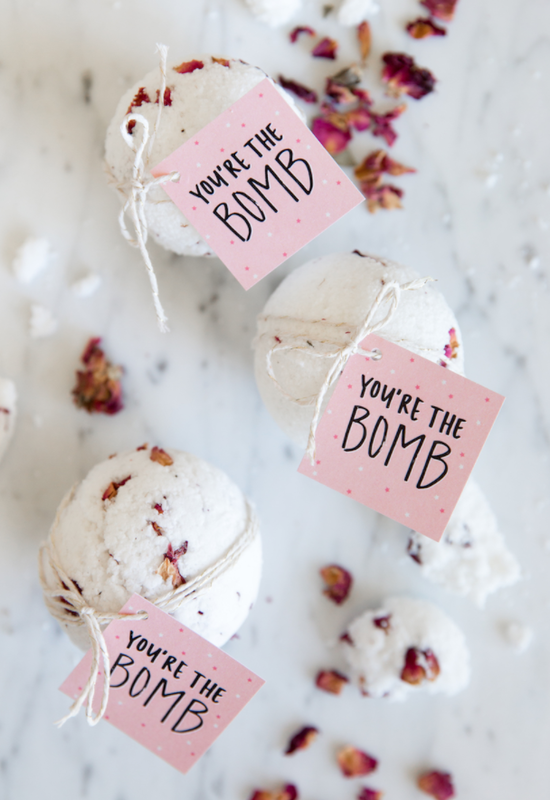 These ‘You’re the bomb’ Valentines bath bombs are gorgeous and sure to be a hit. Not least because of the promise of a romantic bath to go with them! They make a perfect gift, and are relatively straightforward to make. 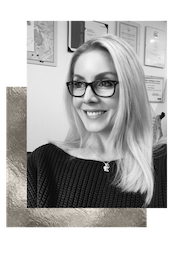 Head over to camillestyles.com to find out how! If you don’t fancy making them yourself, cheat with these lovely ones on Amazon (see pics below, along with some more cheats!). 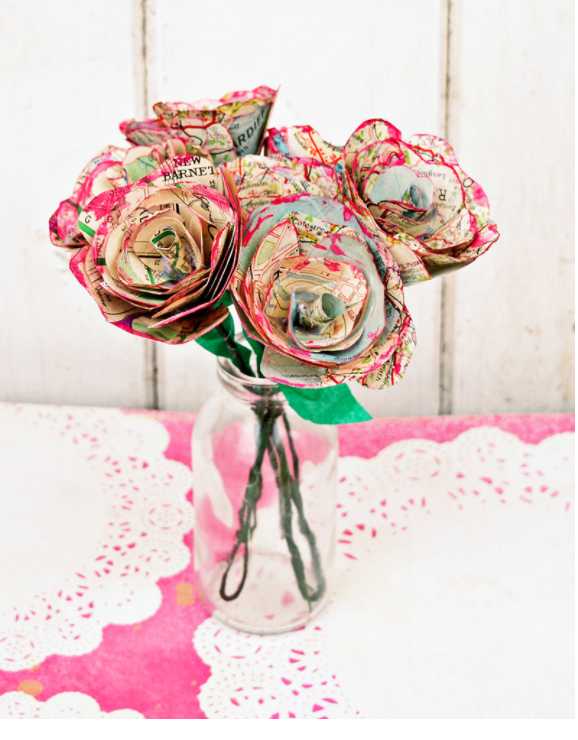 These beautiful map roses aren’t something you’re going to be able to throw together in half an hour, but if you can spare the time and effort, you’re going to be so proud of the beautiful gift you create. These can be made really personal since you can select maps of special places you’ve been together, or hope to go. 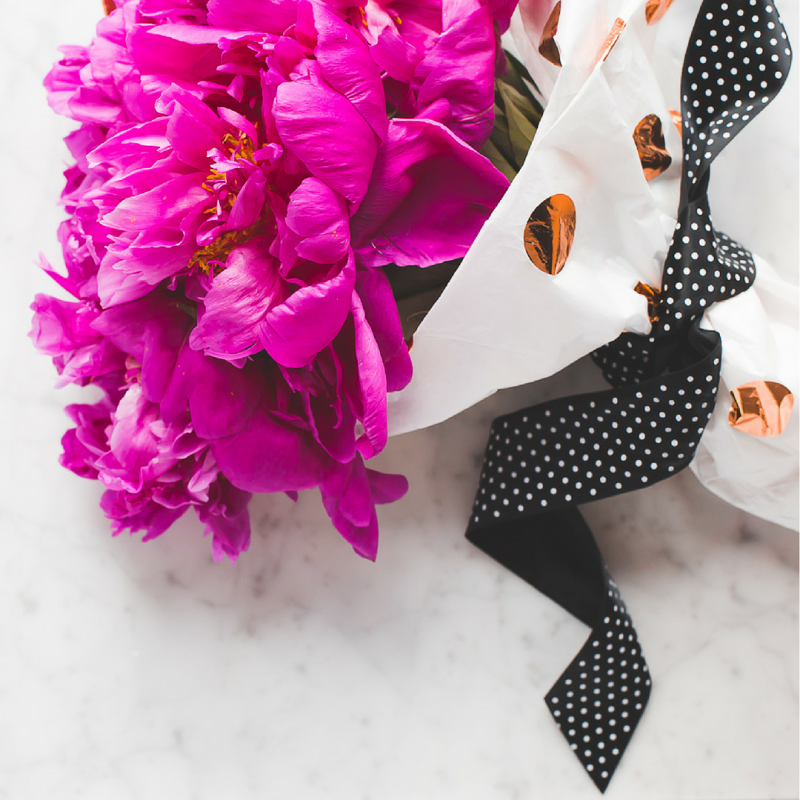 You can also make them look more feminine or masculine depending on the colors you use, and you can choose to create just one beautiful bloom, or a whole bunch. Find all the details on pillarboxblue.com. 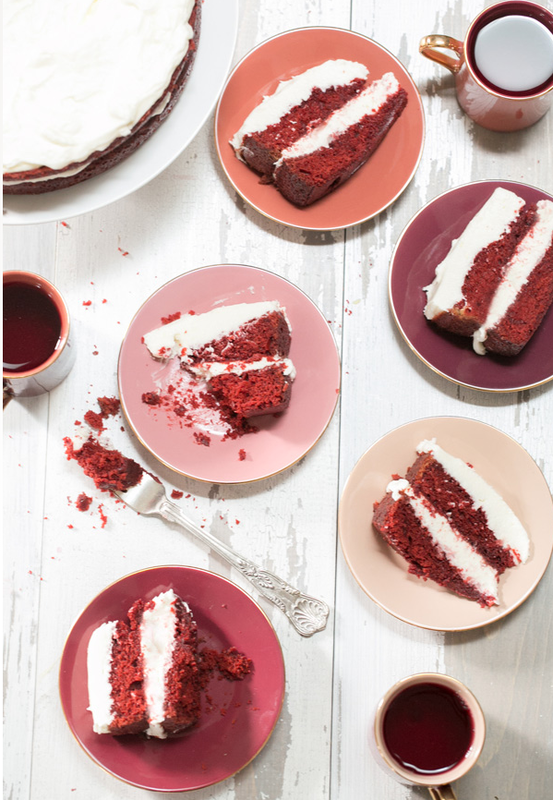 A delicious red velvet cake is a classic Valentines treat! If you enjoy baking, or want to give it a go, we recommend this lovely recipie on sugarandcharm.com. This really isn’t just any old cake, and is sure to be immensely appreciated by anyone with a sweet tooth! This gorgeous romantic wall decor will be treasured for a lifetime, and will look really stylish in your lounge or bedroom. What’s more, you don’t have to go for traditional red or pink hearts, you can customize things to fit with your own color schemes. Find out how to make it at thedatingdivas.com. 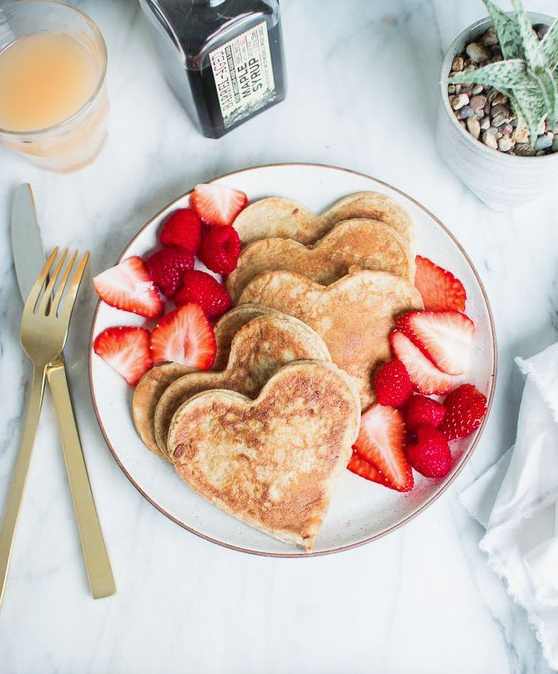 Treat your other half to a delicious breakfast in bed with these special heart shaped banana pancakes. We recommend serving them up with fresh strawberries to make them look even more romantic! Find the recipe on flourishingfoodie.com. You’ll need a heart-shaped pancake cutter, but they’re pretty cheap. 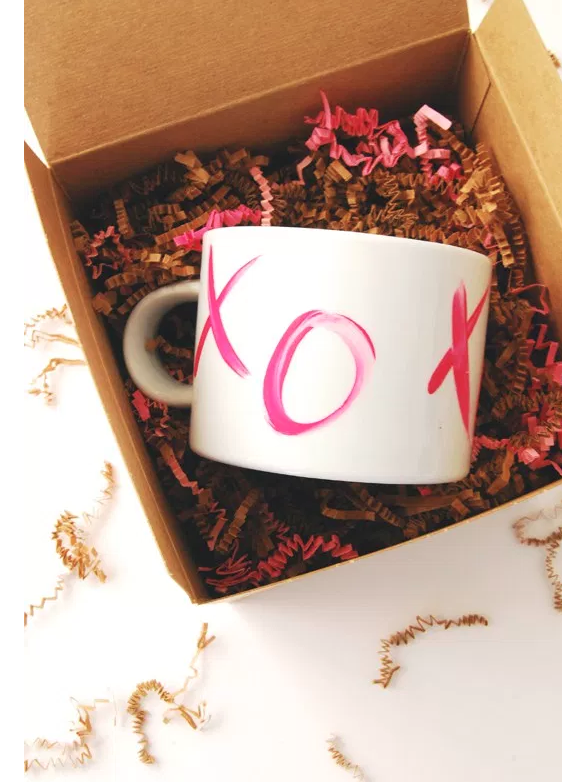 Here’s a simple but lovely Valentines Kisses mug. The minimalistic design makes it a stylish choice, and it’ll probably end up being the most used out of all these DIY Valentine’s Day gifts! You can find the details on theproperblog.com. 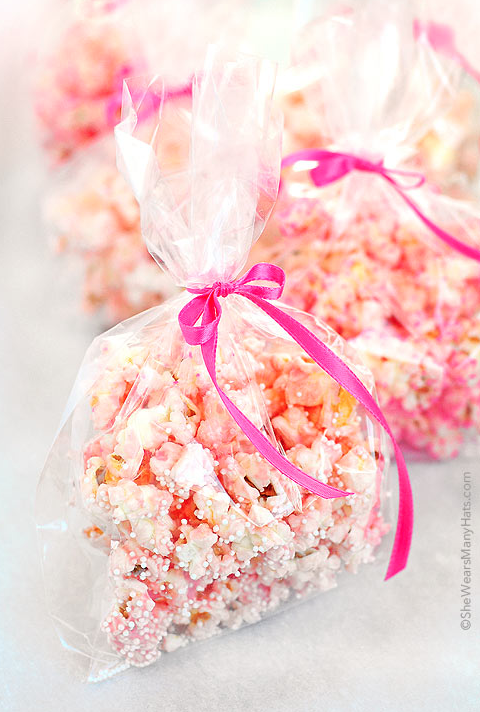 We love this pink Valentines popcorn! 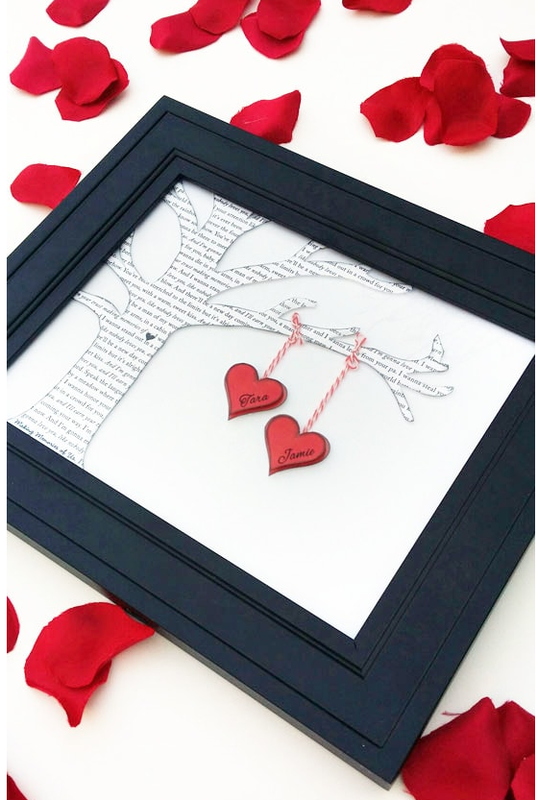 A great gift if you’re planning a Valentines movie night, and would also make a lovely little present for a friend, to show them you’re thinking of them on Valentine’s Day! The instructions are over on shewearsmanyhats.com. 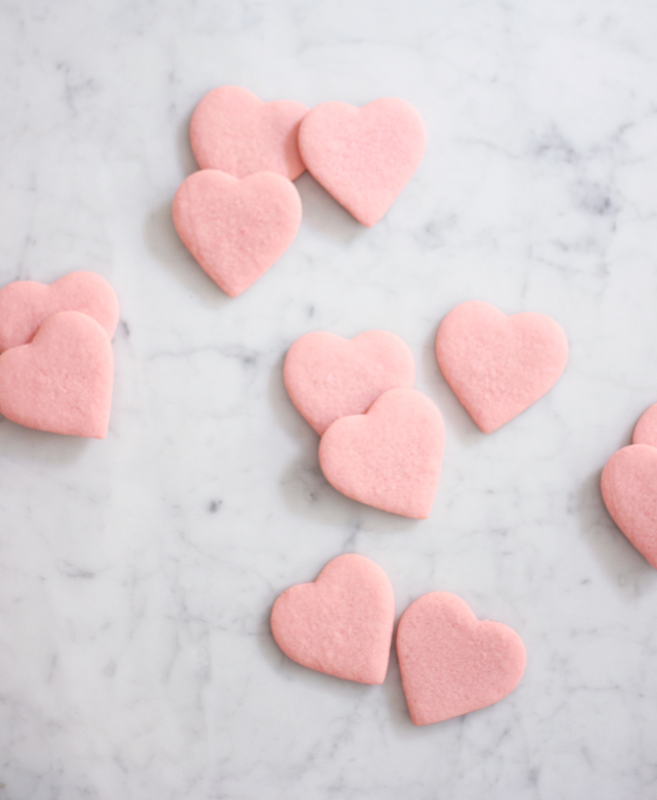 Just how gorgeous are these Ombre Heart Macarons?? It would almost be a shame to eat them. Almost, but they do look incredibly delicious as well as ridiculously pretty! 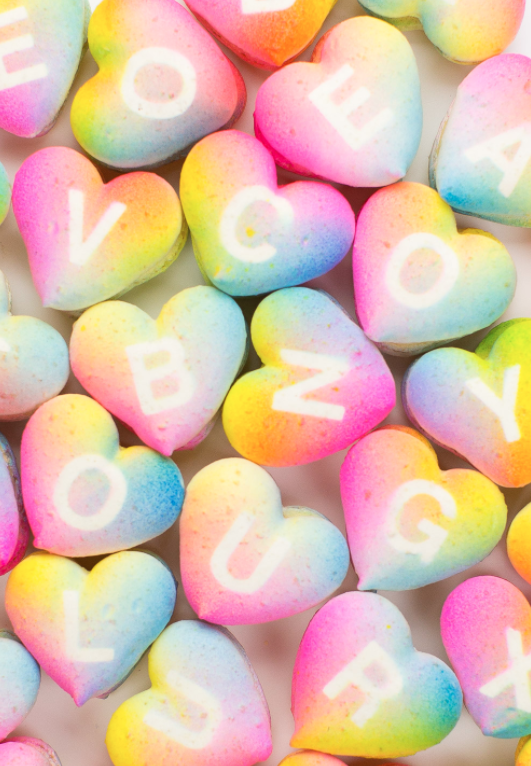 These would make a fantastic gift at any time of the year, but of course the hearts work especially well for Valentines, and you can personalize them with the letters. The recipe is on sugarandcloth.com (which also has a huge amount of other ridiculously pretty stuff on it!!). 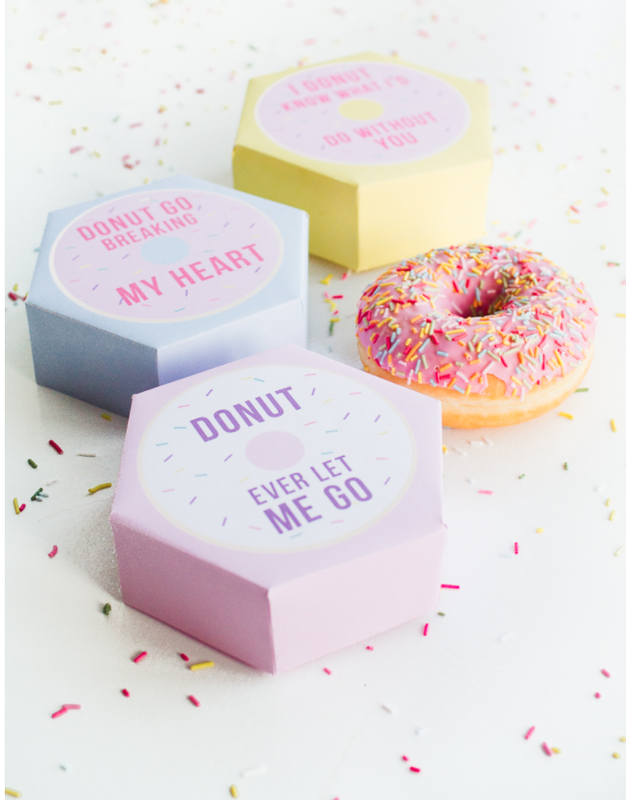 These fun donut boxes are so cute, and so easy to make – since the ladies at bespoke-bride.com have supplied free printables for you to create them with. 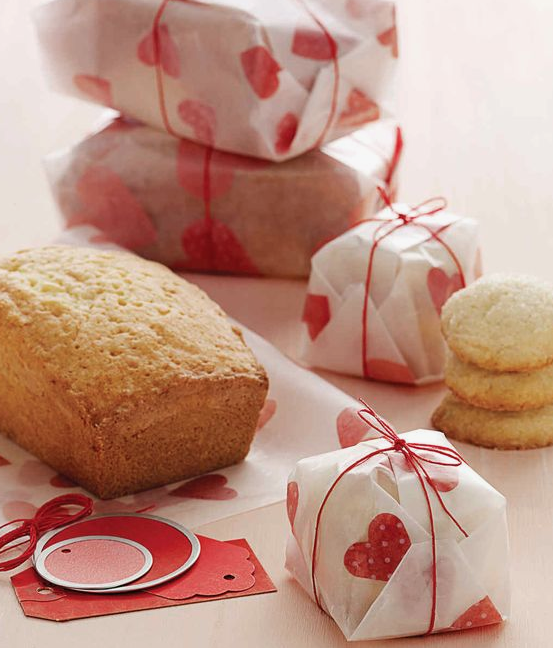 They’re simple, but add an extra special touch to your baked goods! And of course, you’re going to need something to put inside your lovely donut boxes! 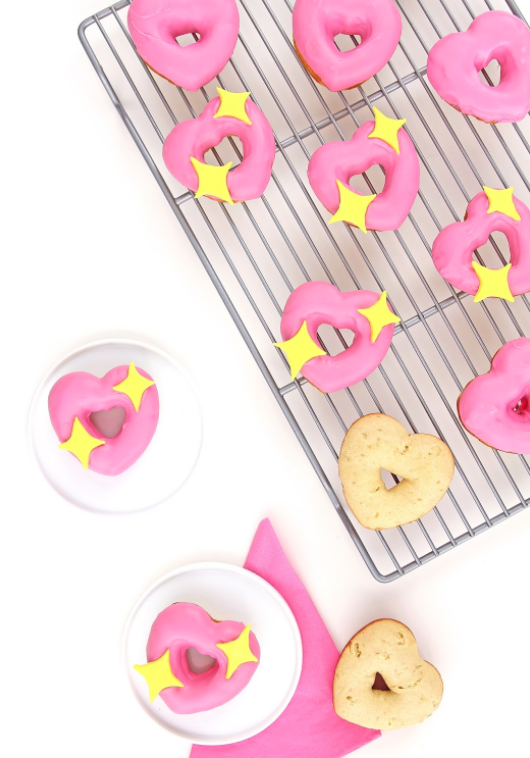 Check out these fun ‘heart emoji’ donuts on awwsam.com. 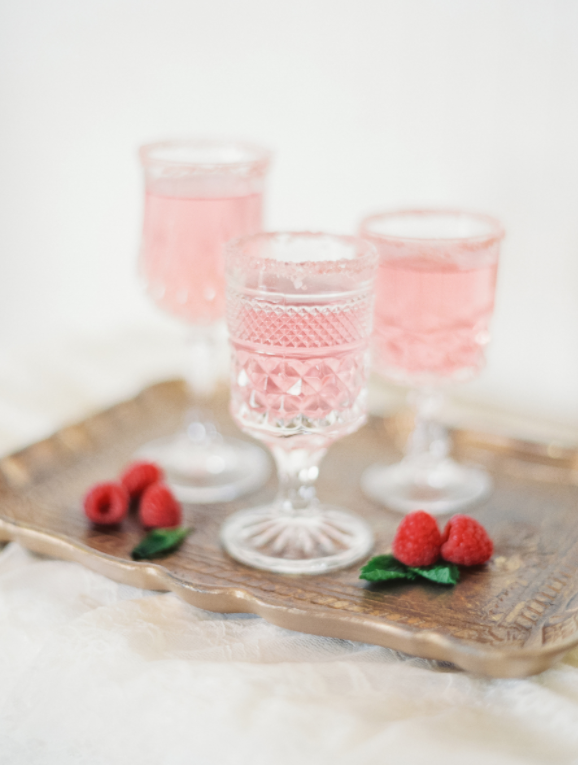 How about an extra special and stylish start to your Valentines meal, with one of these amazing pink cocktails? They’re simple to make, but so pretty, and will add a thoughtful touch to your evening. You could even pair them with the pizzas below if you want to be a bit different! Learn how to make them at stylemepretty.com. 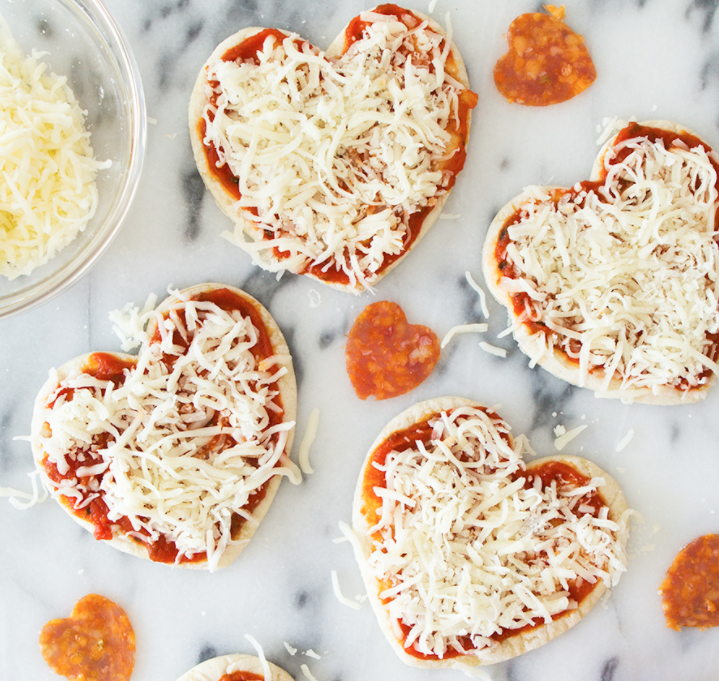 Don’t worry if you’re not much of a cook, you can still create a low-key but special meal with these mini heart-shaped pizzas. Or maybe pack them up and head out for an unusual Valentines date with a winter picnic? Just wrap up, and you can always cuddle up to each other to keep warm! The recipe is over on sarahhearts.com. These little sweetie bags are so cute! 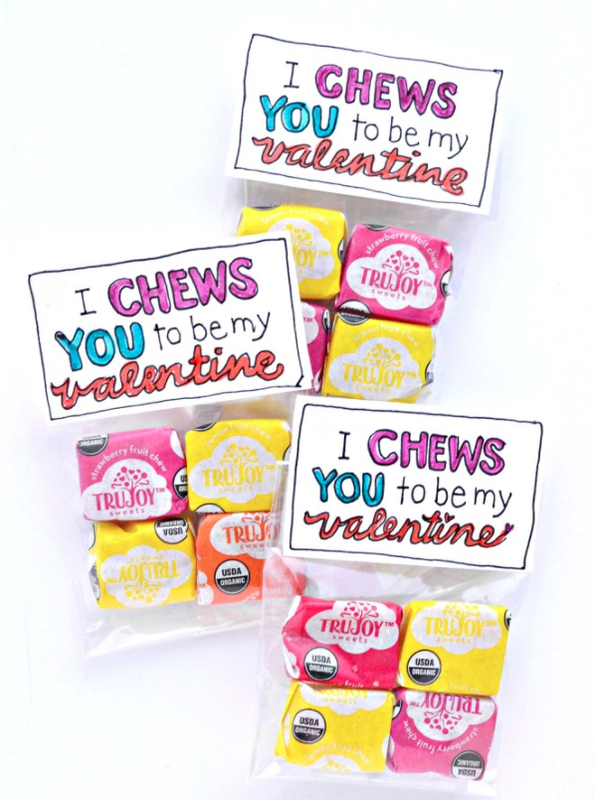 They also make a good option for kids, if you’re trying to include them in your Valentines celebrations! Find them over on forkandbeans.com. You can’t go too far wrong with some pink sugar cookies! Unless you eat them all while you’re baking. Then we can’t help you. We love this particular recipe on saramuellerdesigns.com. And now you need somewhere to put your little sweet treats! Presenting them in this beautiful heart-print wrapping will make your gift extra special. Learn how to make it at marthastewart.com. This lip print wrapping paper works just as well for a present as it does for a bunch of flowers. It’s sure to be appreciated as it’s so personal. And you can use making it as an opportunity to sort out your lipstick collection! Find the details on theglitterguide.com. These pretty fabric envelopes on craft-o-maniac.com are a unique way of presenting smaller gifts, or a special card. 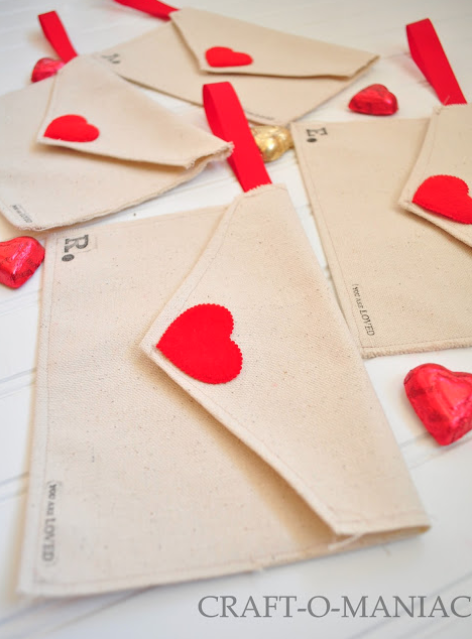 Use the little tag on the corner to hang your envelope somewhere as a Valentines surprise! And 3 Cheat Ideas that Look Handmade! We love getting creative, and adore receiving handmade gifts. But unfortunately, there are times when you just don’t have the time or the energy to get creative. And that’s fine! If you like your gifts to have a homemade look, there are still tons of options that you can buy. 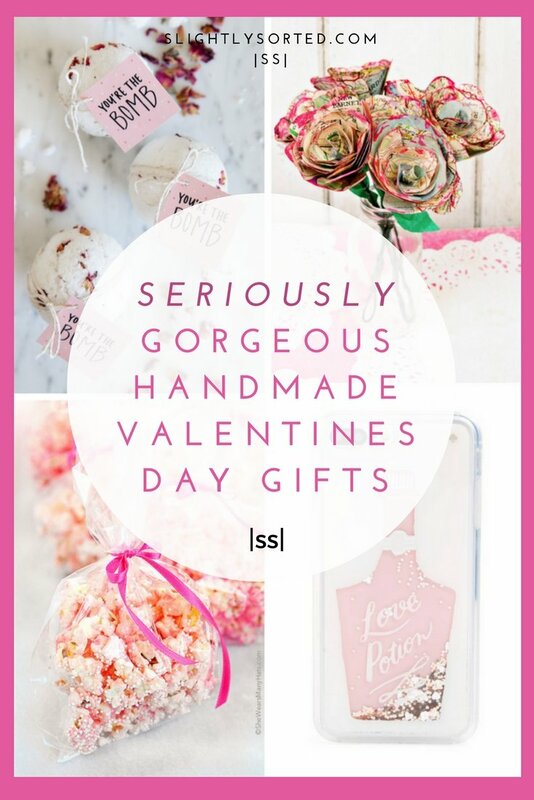 Here are a few of our top choices for Valentine’s Day gifts that look handmade… but aren’t! 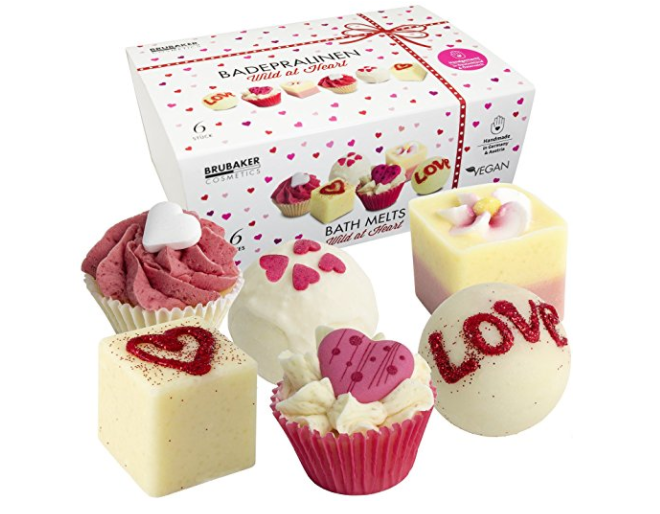 If you don’t have time to make the bath bombs above for yourself, cheat with these beautiful ones ($17.99, Amazon), which look good enough to eat! But don’t eat them. A delicious meal + wine + a relaxing bath with these lovelies = the perfect evening. 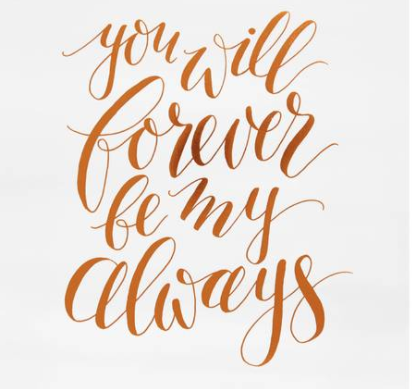 Or how about some simple yet gorgeous wall art to say how you feel? This beautiful print (above) by Fox & Fallow at Nordstrom ($25) says it all. Or you could go for something that really is handmade (by someone else! 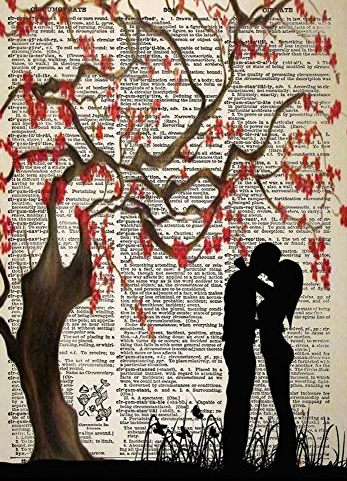 ), like this absolutely gorgeous print on Amazon ($12.99). 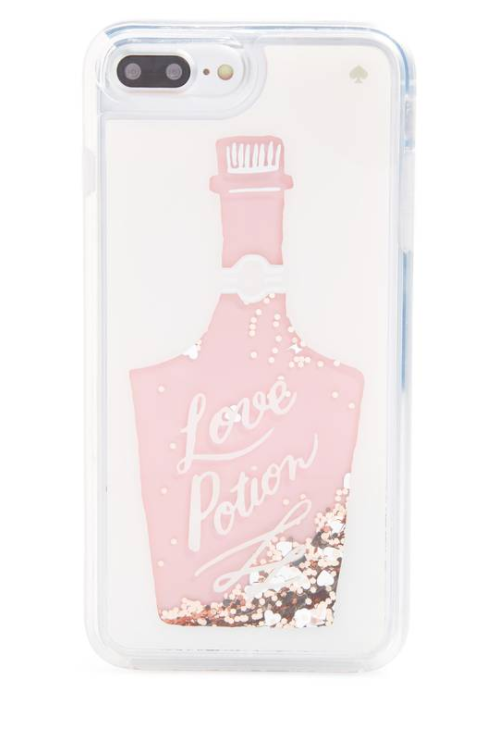 Okay, so no one’s really going to be convinced that this beautiful ‘Love Potion’ Kate Spade phone cover is handmade! 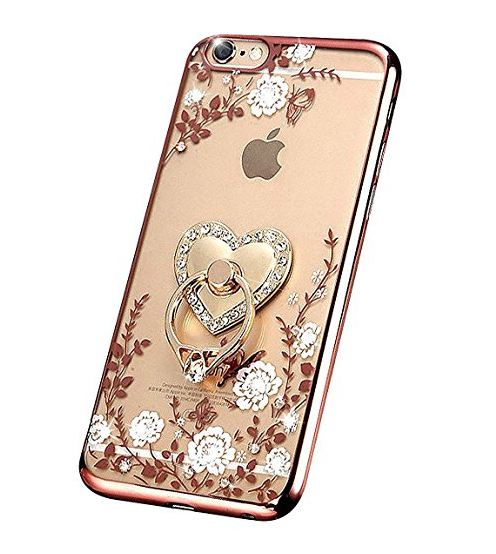 But the embellishment and added detail give it a truly hand-crafted feel, and it really is completely gorgeous. Maybe one to put on your own wish-list if you’re too busy making beautiful DIY gifts for others! It’s around $50 from Nordstrom. And, as always, it’s also worth checking out Amazon for less expensive alternatives. 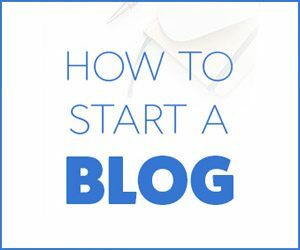 Enjoyed this post?… Why not save it for later on Pinterest!